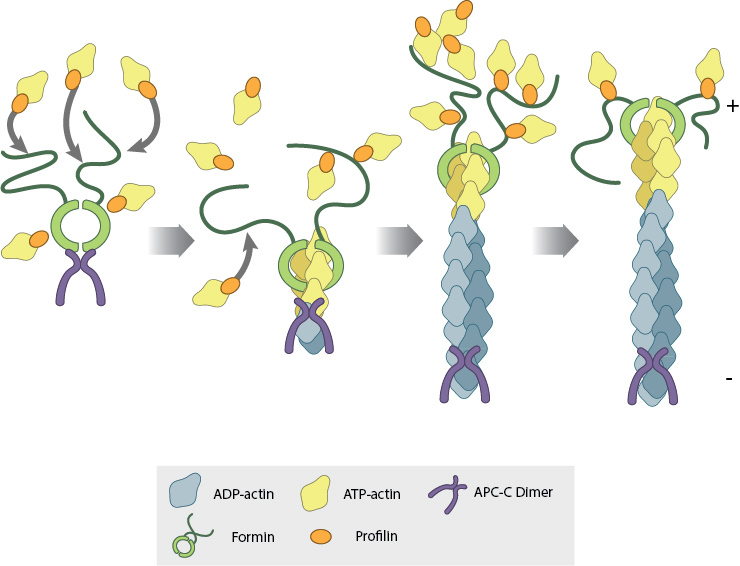 Formins promote the elongation of pre-existing filaments by removing barbed end capping proteins and forming a sleeve around the actin subunits. Formins are also capable of actin nucleation, a process which is spatiotemporally coupled with actin disassembly . 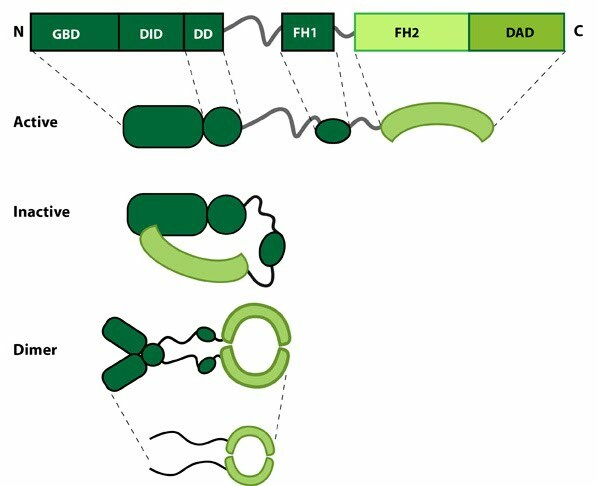 The FH2 domains of the formin dimer (shown in green) bind to actin monomers to initiate filament assembly. Recent studies indicate this is assisted, or even mediated, by additional factors such as APC. The FH1 domains of the formin dimer (shown as black lines) have short polyproline sequences that interact with profilin. Profilin binds to both formin and actin monomers to increase the addition of actin monomers to the barbed end of the filament. It is well-established that activated formins facilitate elongation as dimers and form a donut-shaped complex around terminal actin subunits, orientating themselves toward the (+) end of the actin filament . 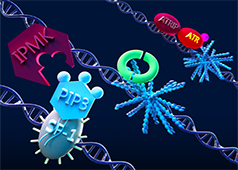 Binding, which is facilitated by FH2 (formin homology 2) domains within the formin monomers removes capping protein from the end of the filament and prevents re-capping to allow continued growth of filaments or cross-linked bundles (, reviewed in ). 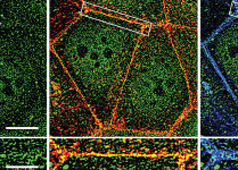 Formins nucleate and polymerize actin filaments at focal adhesions at a rate of around 0.3 µm/min . 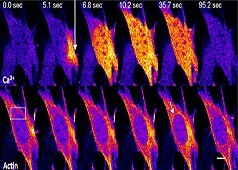 Inhibiting formin protein expression results in a decreased filament elongation rate (0.1 µm/min), coupled with abnormal stress fiber morphology and an accumulation of actin binding proteins (e.g. α-actinin ). 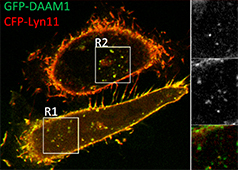 Ena/VASP proteins support formin-mediated filament elongation by tethering the filaments near sites of active actin assembly . Next, each formin monomer binds and captures profilin units, which are themselves already bound to G-actin monomers. This interaction is mediated by multiple stretches of polyproline residues within the FH1 domain of formins . This domain is known to range from 15-229 residues, consist of between 35% and 100% proline residues, and contain up to 16 profilin binding sites . Profilin maintains a steady pool of actin monomers by promoting ADP to ATP nucleotide exchange on G-actin . These monomers of ATP-G-actin are then added the growing actin filament. The coupling of formin with the growing end prevents capping and allows continued growth of the filaments . Formins could, in theory, contribute to protrusive forces by remaining attached to the barbed end of actin filaments  (reviewed in ). Consistent with this notion, excessive formin activity promotes cell migration. However, the specific mechanisms involved remain unknown given that formin-induced activity does not impact the overall adherence of cells to their substrate, nor does it change the avidity or affinity of cell adhesion receptors (e.g. integrins) .